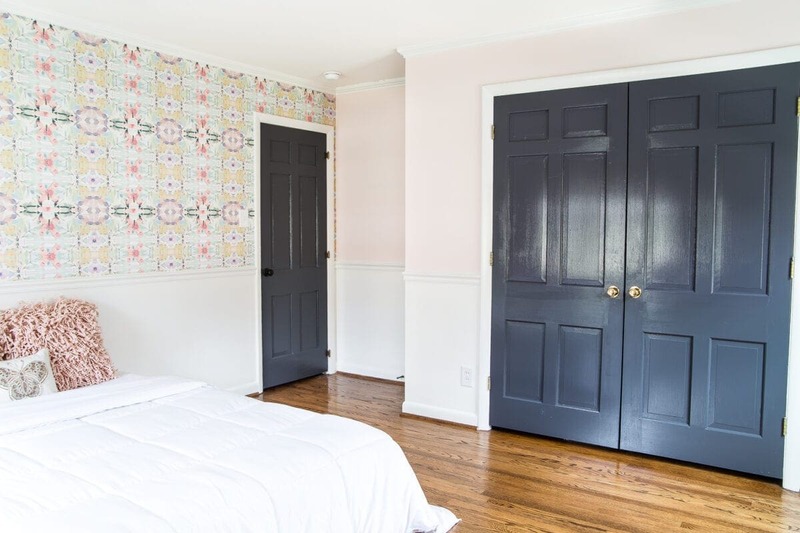 Is it weird that I want to move in to our daughter’s room? Because it’s so absolutely stinkin’ ADORABLE! We hadn’t touched this bedroom at all since we moved in last April. To be fair, we’re been preoccupied with the living room, breakfast nook, foyer, playroom, dining room, master bedroom, hallway bathroom, powder room… okay, you get the picture. All kinds of busy. Enter the mom guilt. But with a new little one on the way, I’ve been determined to make Olivia feel extra special and big-sister-ready so that when we start working on the nursery, she’ll already have her own pretty space. She was gone out-of-state last week to visit some of our close family on spring break, and while she was gone, I painted like crazy for 3 days and my mom came over to help me put up wallpaper over the weekend (while jamming out to Oldies, of course). I so wish I’d recorded Olivia’s reaction when she got home and saw it for the first time. To sum it up, ALL the fan girl squeals. 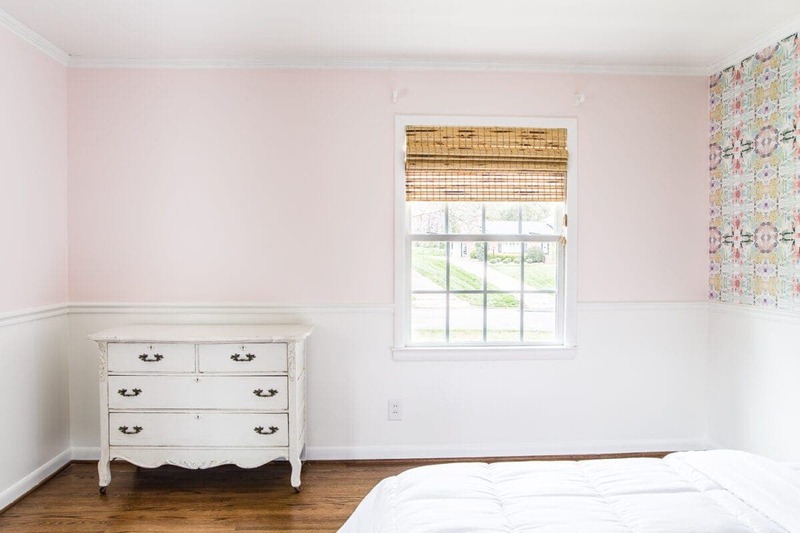 I painted the walls Behr My Sweetheart, which is just the perfect light blushy pink. 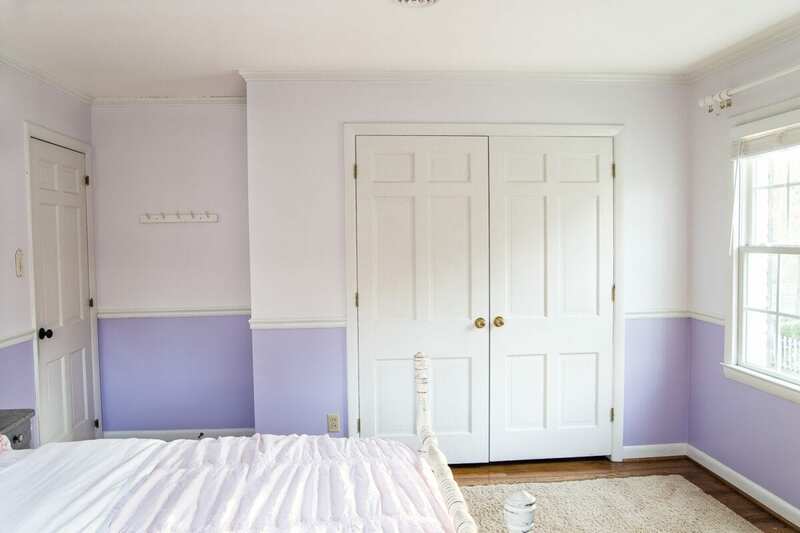 And the trim is Benjamin Moore Simply White. Robert and I are planning to add picture frame molding below the chair rail at some point. 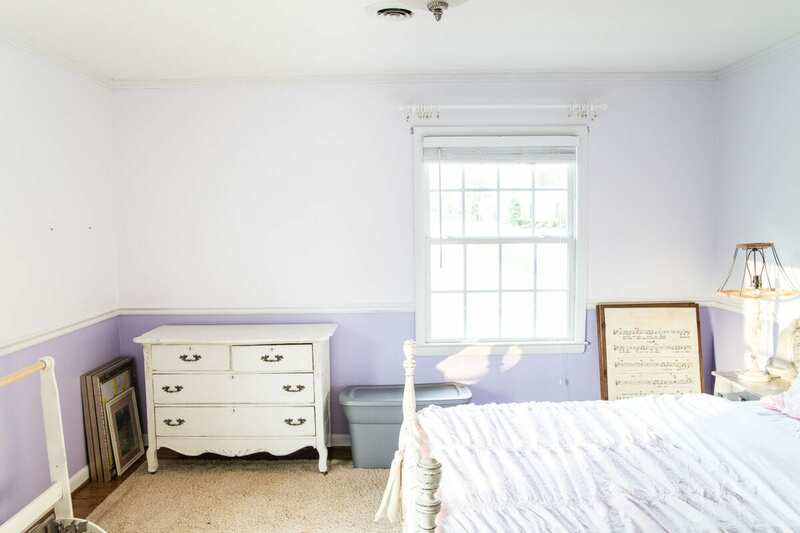 Olivia’s only two requests for her room were butterflies and pink. So that was the plan. 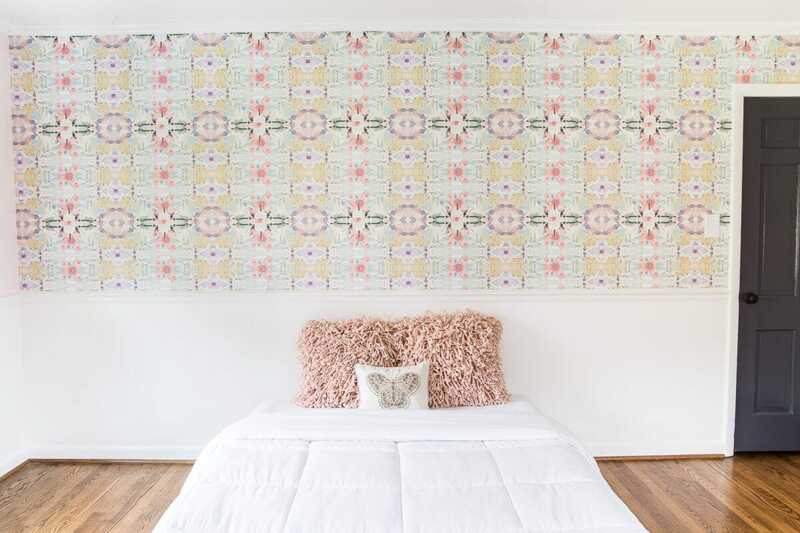 I searched high and low for butterfly wallpaper and found this wallpaper pattern at Anthropologie that I thought would be so perfect for transitioning into pre-teen/teenage years since Olivia is turning 6 this fall. It was a total splurge, but since it was only one wall and only the portion above the chair rail, it was completely worth it. I continued the black door trend that we have going on in the rest of the house too by painting hers Benjamin Moore Wrought Iron. I’ll still most likely change out the doorknobs for bronze or glass ones. Robert and my dad ripped up the old rug to reveal the pretty hardwoods underneath. We’ll be rolling out a smaller soft rug eventually just so Olivia doesn’t have to step out of bed onto a cold floor every morning. That Craigslist dresser is getting a makeover very soon in a week or two. And I replaced the old blinds with these warm bamboo shades. At this point, curtains, the new bed, nightstands, a new light fixture, and some wall decor is next on the agenda. Hang ballet barre with mirror? I have a feeling we’ll get this knocked out in no time at the pace we’re already moving. Here’s hoping anyway! Where did you buy the bamboo shades? Absolutely Beautiful! Love it all. Excited to see the finished room. Your Olivia is one lucky little lady. Maybe I missed it, but do you know if you are having another precious little lady or little man? It’s so beautiful, Lauren!! I can only imagine your daughter’s face when she saw it!! You’re always inspiring…thank you for another amazing transformation and allowing us all a little into your lives to see these amazing ideas brought to life! Wow that is such cute wallpaper. I bet Olivia will be more than happy in that new room of hers. I can’t wait for the bed to come. That wallpaper is beautiful! ? The room is surely on its way to being another winner! Just beautiful! You have a gift and thank you for sharing it with us. Spring is here, and I am getting motivated and inspired by you! On my way to order some new carpet for my husband’s office/guest room. More to come, too! 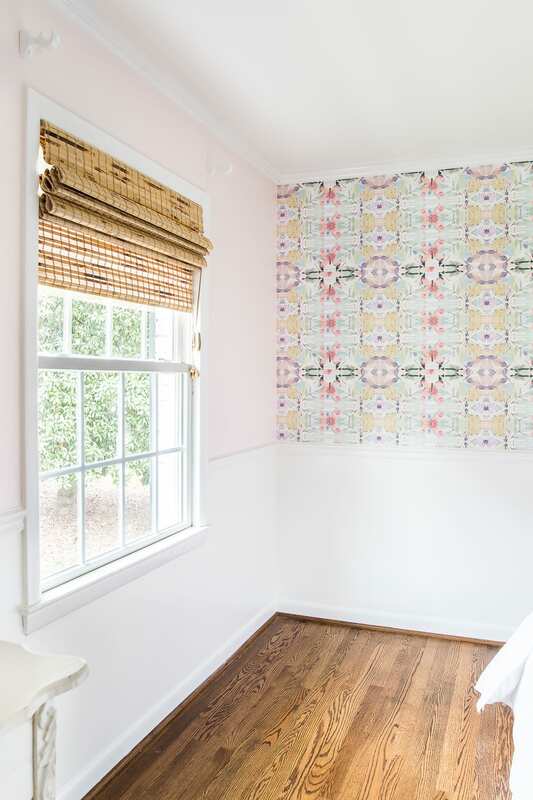 Lauren, your precious little gal will just feel like a “princess” in her new bedroom! It’s so beautiful! So nice to surprise her! 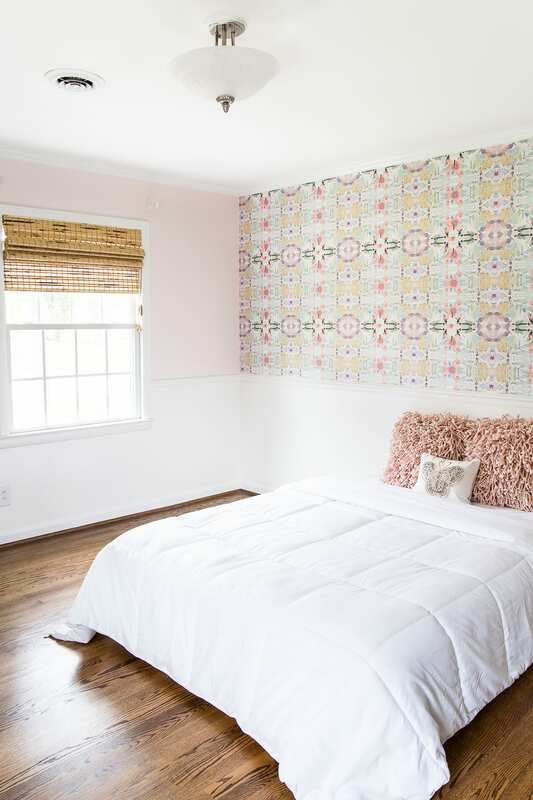 Oh my Lauren, Olivia ‘s room is dreamy. Can’t wait for the full reveal. Just beautiful!!! I’m delighted in all your wonderful posts!’! Ummmmm I would want to move in there too! That is gorgeous!!! And please put a ballet bar in with a mirror. That is a serious dream of mine. But then I remember I don’t do ballet. Or dance, other than like a crazy person hahaha. Ah, I love her room! This turned out so cute! love the wallpaper!